View of the Centre International de Recherche sur le Verre et les Arts Plastiques (CIRVA), Printemps de l’Art Contemporain, Marseille 2017 © jc Lett. 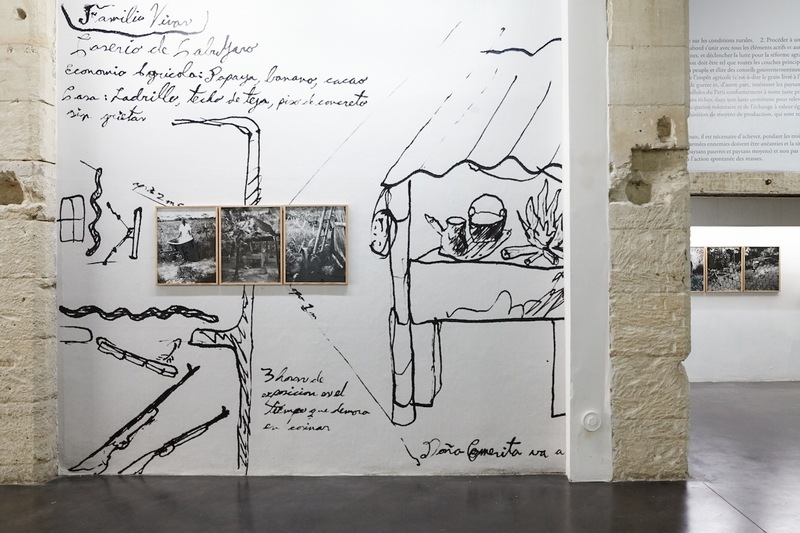 Installation view of Marcos Avila Forero at La Compagnie, Lieu de Creation, Printemps de l’Art Contemporain, Marseille 2017 © jc Lett. View of ‘Viandes foraines’ with works by Laurent Faulon, Delphine Reist, Jean-Baptiste Sauvage and Thomas Teurlai at Friche La Belle de Mai, Printemps de l’Art Contemporain, Marseille 2017 © jc Lett. 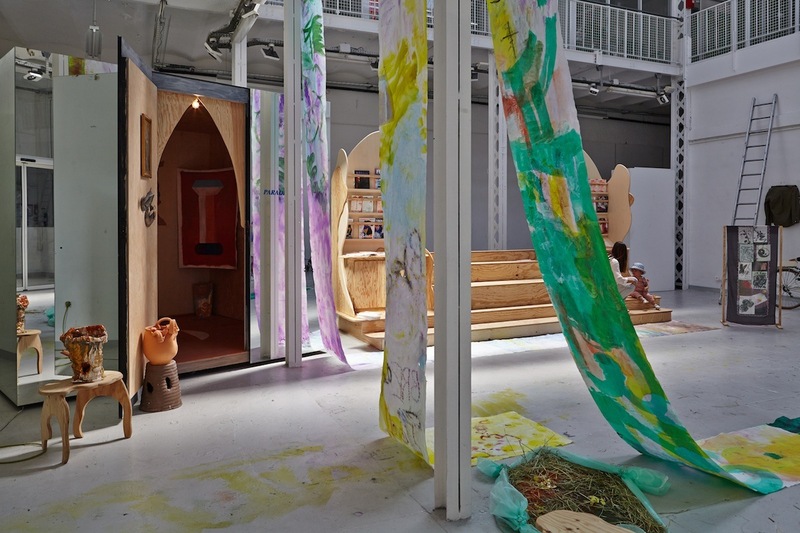 View of ‘Patio, pièce de Verdure, détente’ with works by Antonin Horquin, Anne Le Troter, Linda Sanchez and Emmanuel Simon at Friche La Belle de Mai, Printemps de l’Art Contemporain, Marseille 2017 © jc Lett. View of Lina Jabbour, ‘Variations’ at videochroniques, Printemps de l’Art Contemporain, Marseille 2017 © jc Lett. Gilles Desplanques, still from Les boues rouges, 8′, 2017, image courtesy of the artist. Installation view of Tiziana La Melia at Paradise, Maison des ventes Leclere, Printemps de l’Art Contemporain, Marseille 2017 © jc Lett. 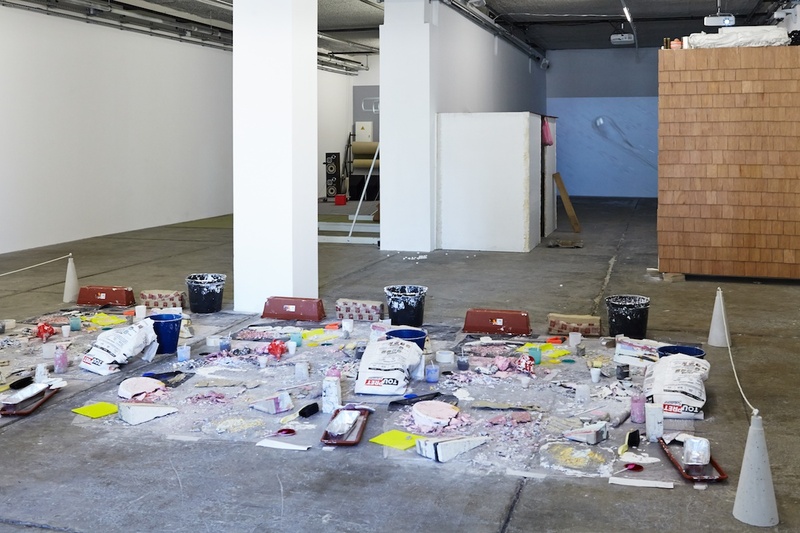 View of Aurélie Pétrel’s work at Atelier Ni, Printemps de l’Art Contemporain, Marseille 2017 © jc Lett. View of Emmanuelle Villard, ‘Back to Pleasuredome’ at Togu Art Club, Printemps de l’Art Contemporain, Marseille 2017 © jc Lett. View of Philippe Turc, ‘Grigri chercheur d’or’ at Galerie Meyer, Printemps de l’Art Contemporain, Marseille 2017 © jc Lett. View of Estel Fonseca, ‘Sauvetage Vertical’ at Straat Galerie, Printemps de l’Art Contemporain, Marseille 2017 © jc Lett. Installation view of Marc Quer, ‘Le bas des tours’ at Espace GT, Printemps de l’Art Contemporain, Marseille 2017 © jc Lett. View of ‘Beautiful Africa’ with works by Kapwani Kiwanga, Abdoulaye Konaté and Namsa Leuba, at Galerie du 5eme, Printemps de l’Art Contemporain, Marseille 2017 © jc Lett. Michaële Cutaya was invited in May by Marseille Expos to attend the opening of the ninth edition of the Printemps de l’Art Contemporain (PAC), a yearly event that takes place over three weeks in Marseille and its region – this year it included for the first time events in Aix-en-Provence, Istres and Châteauneuf-le-Rouge. It is the occasion for the 40 plus participating art organisations of the association Marseille Expos  to display the vibrant contemporary art scene of the city by opening their doors, setting up visits and encounters with artists, and organising events and performances. It had been nearly 20 years since I spent any length of time in Marseille, a city I lived in for a few years in the early 1990s. In places the city was unrecognizable. Since the launch of the Euromediterranée project in 1995 Marseille has undergone massive urban change. As elsewhere the arts and culture have been enrolled to “serve as growth engines”  to take Marseille on its post-industrial future. This project was given a powerful boost by Marseille-Provence 2013, the European Capital of Culture programme for the city and the region. The most visible changes have taken place in the docks area with, among other things, two new architecturally designed buildings opening in 2013: the relocation of the Regional Fund for Contemporary Art (FRAC) from its scattered premises to la Joliette in a building designed by Kengo Kuma (the date was coincidental since the move had been planned years ahead) and the opening of the Museum of Civilizations in Europe and the Mediterranean (MuCEM). The MuCEM building, designed by Rudy Ricciotti, has quickly become an icon of the new Marseille, and even the fiercest critics of the urban regeneration it heralds recognise the success of its conception, most notably its integration and opening up of the 17th century Fort St Jean with a 12th century chapel within its walls which had long been closed to the public. The Ecoc year also expanded the membership and ambitions of the association Marseille Expos which, although it counts amongst its members large institutions such as the FRAC and the MuCEM, has at its core the incredibly rich associative structures that are implanted throughout the city, as its president, Pascal Neveux, puts it. The three weeks of the PAC is for the visitor a great opportunity to encounter the contemporary art scene of the city in all its diversity, and indeed it is from the smaller spaces spread out all over Marseille that one gets a sense of the very singular creative energy at work here, whether from the converted industrial spaces at the Belle de Mai, a sheltered villa overlooking the sea in Endoume, an old joinery in the Panier, a string of small galleries between La plaine and the Cours Julien or a cavernous hall in the populous Cours Belsunce. Particularly striking are the converted industrial spaces with their massive beams, cream coloured stone walls and metal structures, they serve as studios for artists, production workshops and exhibition spaces. Perhaps the most emblematic of them is Friche la Belle de Mai, installed in the huge site of a tobacco factory which closed its doors in 1970. It was invested by a theatre association in 1992 and has developed progressively to include archives and documentation research centres as well as offering artists’ residencies and some impressive exhibition spaces. The main exhibition during the PAC, ‘Viandes Foraines’, was the result of such a residency programmes. 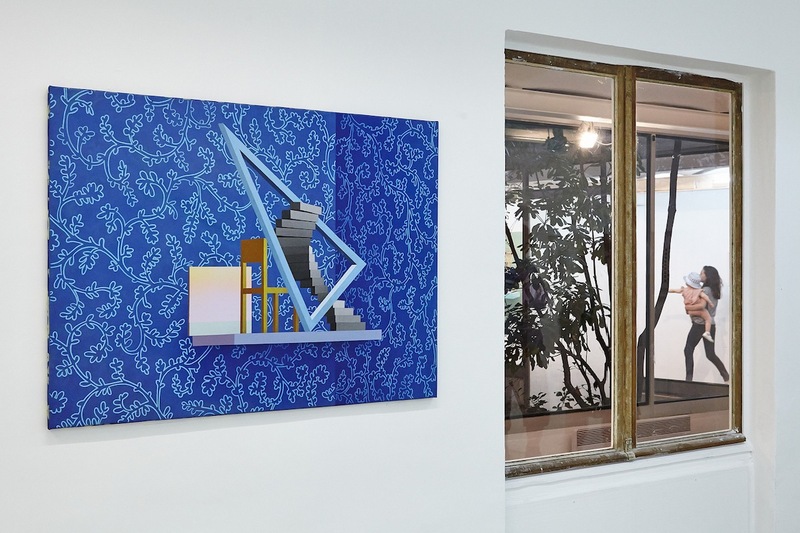 The four exhibiting artists, Laurent Faulon, Delphine Reist, Jean-Baptiste Sauvage and Thomas Teurlai, started the conversation during a month long residency in 2016. They share a desire to site their work within specific contexts and here responded to the industrial past of the building. They each assembled a production line like an unfolding of their artistic method, a series of suspended gestures. 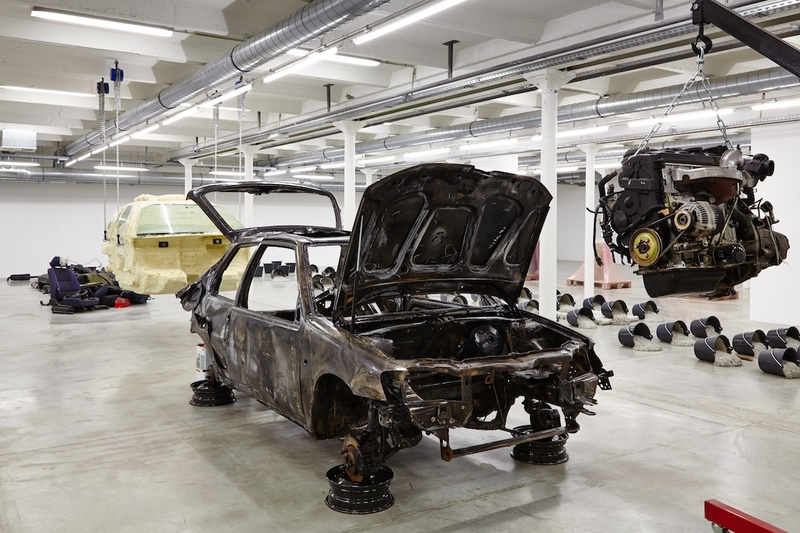 The most striking perhaps was Laurent Faulon’s with a burnt car at its head, which at first glance looked like one of those cars that gets set on fire in the suburbs on various festive occasions. On closer inspection and working through the line, the burnt car turned out to have been methodically taken apart, disembowelled, moulded, burnt, varnished and arranged into what would be best termed a dis-assembly line. 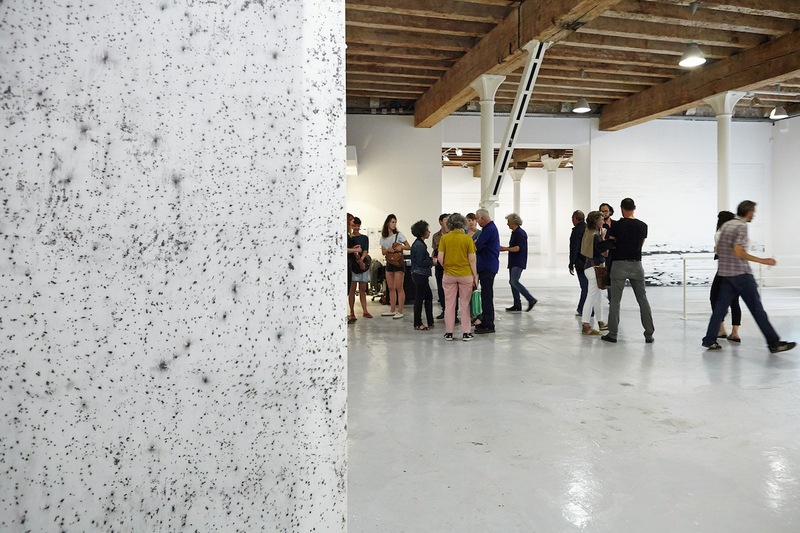 A methodically produced accident is also found in the work of Delphine Reist, with the accidentally tipped bucket of concrete, which might happen on a building site, here repeated dozens of times and arranged in a grid. The accident belongs to artistic practice whereas repetition is the realm of the production line, thus the repetition of accidents blurs the line between artistic gesture and industrial production. The effect was compounded by the near exact reproduction of the first floor of the exhibition on the second floor, inducing an unsettling moment of bewilderment and disorientation for the visitor unsure of one’s whereabouts. This tension between the singularity of the artistic gesture and methodical repetition was also at play in Linda Sanchez’s floor installation L’Autre for ‘Patio, pièce de verdure, détente’ in the salle des machines. From a seemingly accidental array of traces and objects on the floor as one might encounter in an artist’s studio, there emerged a pattern: a thrice repeated moulding process so that the leftover traces and objects are as near reproductions of each other as possible. Rather than an assembly line however, they formed product-less constellations. 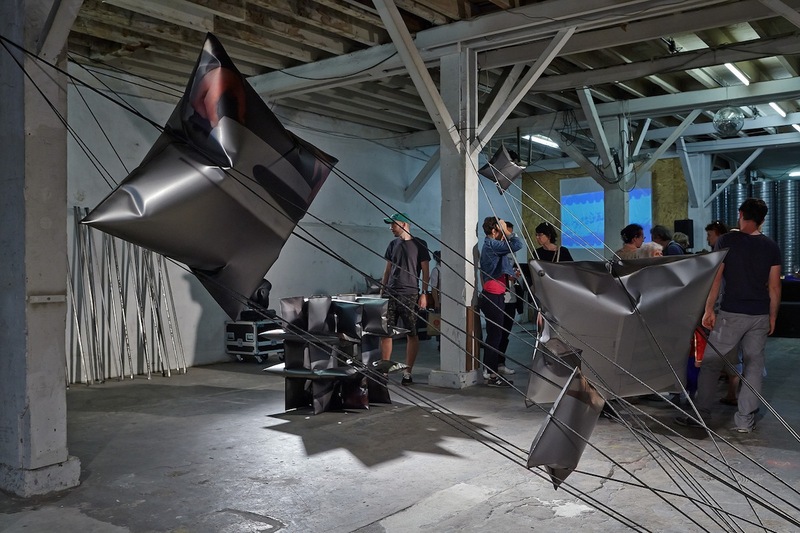 Some of this methodology resonated with ‘Variations’, the work of Lina Jabbour exhibited at videochroniques, an old joinery workshop. Her Trames series is made of tiny touches of colour using a RGB colour system on graph paper, the effect is to make pointillism look spontaneous. Yet they are not without idiosyncrasies, poetic errors and, like the Fenêtres series, quite atmospheric. For one of the murals in the show, she used a bricklayer’s cord to trace horizontal lines, but with graphite powder instead of ink, making lines of varying intensity. The show developed subtle connections with the space, visually or materially as in Mue which hung like a discarded skin with the imprint of the concrete floor of the basement – which remained unseen in the dark. The industrial age intruded in a different way in Timothee Tallard’s paintings at the Gallery Gouvernnec Ogor. The optical effects of the paintings were due to his mix of paint, alcohol, xylene and hydrocarbon, thus capturing the alluring toxicity of petroleum. 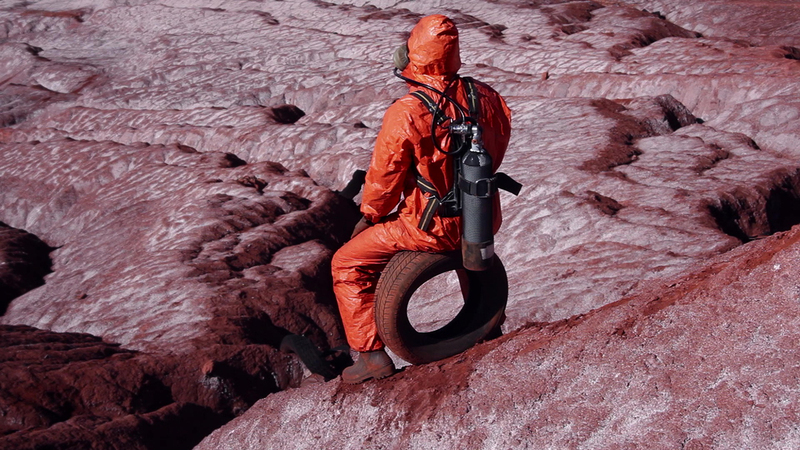 Also exploring the frontier between fascination and toxicity, Gilles Desplanques in Les Boues Rouges, a video part of his exhibition ‘Heterotopia’ at the Château de Servière, shows us a lone figure with respiratory mask and orange protective clothing making his way through a red sludge wasteland while either carrying, pushing or occasionally sitting on a car tyre. Questioning the art world’s obsession with ‘Post’ – whether modern, industrial or human – the curators of Paradise–Maison des ventes Leclere, Charlotte Cosson and Emmanuelle Luciani, call for the reconsideration of the ‘Pre’ and here presented an exhibition by Tiziana La Melia where bales of hay were installed to conjure up an atmosphere of fairy tales and folkloric tradition. They developed the notion further in the introduction to ‘Pré-Capital’ – an exhibition they co-curated with Nicolas Bourriaud – proposing a form of artistic degrowth in presenting artists whose practices embrace crafts, the collection of objects, an interest in popular traditions and rural ways of life to address contemporary issues. If the concept fails to conjure new obvious perspectives, it does point out how necessarily simplistic the techno-progressive narrative is, since at any given historical period several modes of productions co-exist in a non-exclusionary manner. 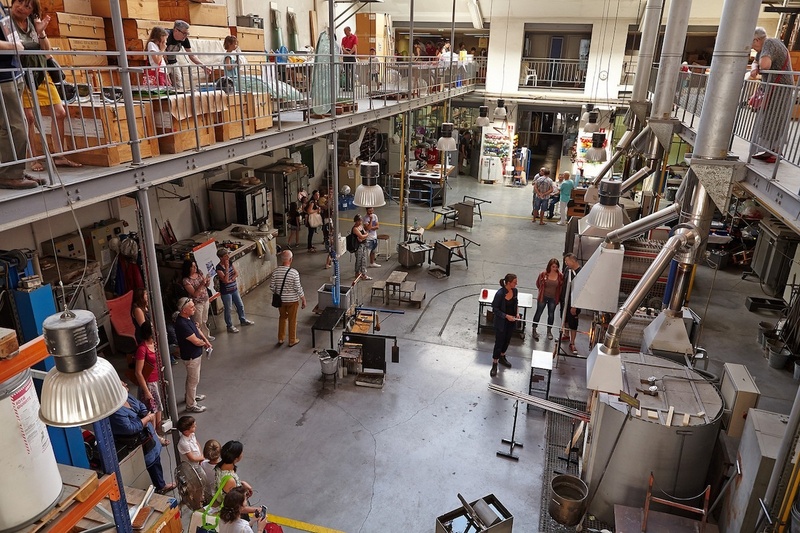 Thus artists today work with the latest digital technologies as well as with traditional crafts, as could be seen in the production workshops of the CIRVA (glass work), the Atelier Ni (Metalwork) or in the number of artists working in and around craft practices. Emmanuelle Villard at Togu Art Club, off the rue Paradis, presented ‘Back to Pleasure Dome’ in the stylish exhibition spaces of the architect’s studio, which functioned as a perfect jewellery case for Villard’s work. Her artworks play with the tropes of high modernism, be it monochrome, stripe, drip or square format, but choosing materials such as glitter, mirrors, pearl, gold, ceramics or coloured glass, more readily associated either with craft or female fashion accessories. 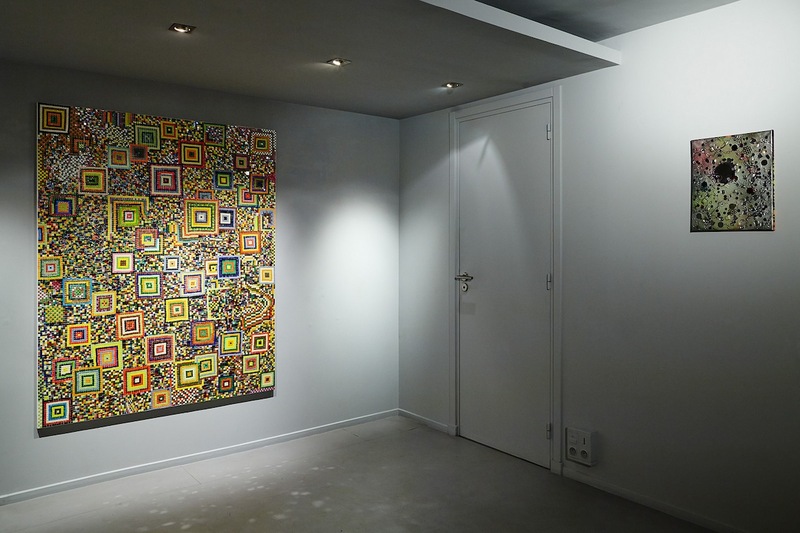 Further, off the streets leading up to the basilica of Notre-Dame de la Garde – Marseille’s patron saint – Philippe Turc’s exhibition at the Galerie Meyer felt like an island of coloured sensations. Enlarged sea urchins made of ceramic lay open on a sandy bank, offering up the glistening orange flesh of their gonads – a much sought after delicacy – amongst glittering fragments of shell. ‘Grigri chercheur d’or’ is a project that was developed through a residency at the Logoscope Monaco in collaboration with the ceramic workshop, using traditional and experimental technologies . One of the recurring criticisms levelled at Marseille-Provence 2013 was its lack of engagement with the city’s inhabitants and the local culture, particularly in regard to popular neighbourhoods. The Marseille based hip-hop singer Keny Arkana, for instance, released a video titled Marseille Capitale de la rupture (2013) , a scathing critique of how the urban/cultural regeneration process is changing the city. That Marseille expos took care to include in the PAC programme a weekend of events in the northern suburbs or that the Museum of Contemporary Art (MAC) was hosting a large exhibition on Hip Hop may be signs of a changing attitude . Marseille has long been renowned for its lively Hip hop scene, it was thus somewhat disappointing that the exhibition ‘Hip hop: un âge d’or’ remained safely historical – as well as being tucked away on the southern and more opulent side of the city. 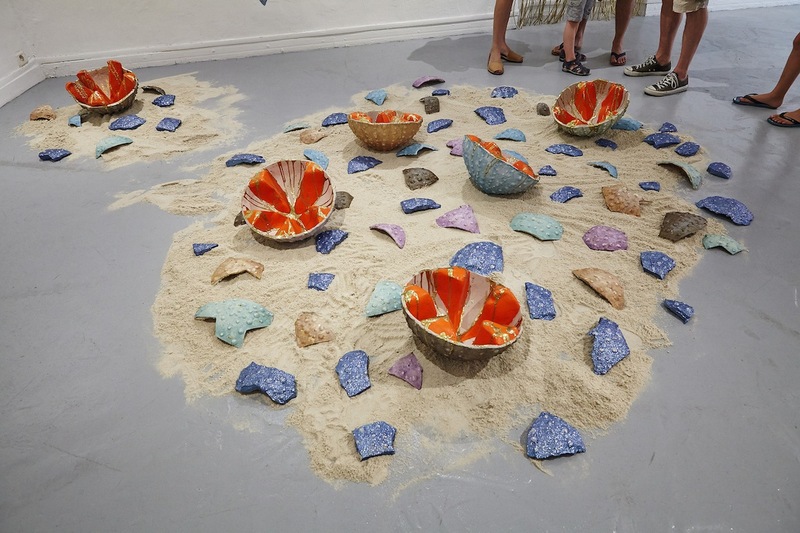 Perhaps it was a similar desire to connect with the everyday life of Marseille that led the MuCEM to dedicate one of its exhibitions to the economy of waste in Marseille and in the Mediterranean. ‘Vies d’ordures’ – which translates as ‘life of garbage’ but sounds like ‘garbage chute’ – with the subtitle ‘The economy of trash’ was part ecological pedagogy, part ethnographic and part artistic. The subject is topical, since like many other Mediterranean cities, but unlike any other in France, the Marseille economy of trash takes place in full sight of its inhabitants with much of the disposal and recycling, the formal and the informal alike, happening in the streets – while repetitive garbage collection strikes have added to the city’s infamous reputation. Yet, as the professor of ecology who was interviewed for the exhibition accompanying publication, points out, not without first admonishing the locals for their lack of public spiritedness, the problem is one of image as Marseille is actually no more polluted than any other large cities . Marseille’s economy of trash does not ‘look’ good, that’s the problem. But it is precisely this untidiness – along with its vibrant mix of Mediterranean cultures, low rents and sunshine – that has attracted artists from all over Europe to the city, long before its branding as a city of culture. Another form of arrangement was offered by Marc Quer in ‘Le bas des tours’ (At the Bottom of the Towers) at the Espace GT in the docks area. His work builds narratives around used objects, surplus objects – some have been found, some bought at the flea market and some are his own. These objects are arranged and re-arranged with each new exhibition, self-portraits of sorts, forming new combinations that superimpose intimate life and urban planning. Here, the towers of the title immediately called to mind the two Euromediteranee’ skyscrapers that have surged a few streets away since 2011. Designed by Zaha Hadid and Jean Nouvel, the towers have become the most visible symbols of Marseille’s urban regeneration. The demolition process this regeneration entails is alluded to in one of the exhibited pieces: a demolition notice panel on which the middle is marked by the X of the support of a depleted Christmas tree, a rather ominous ‘You Are Here’. 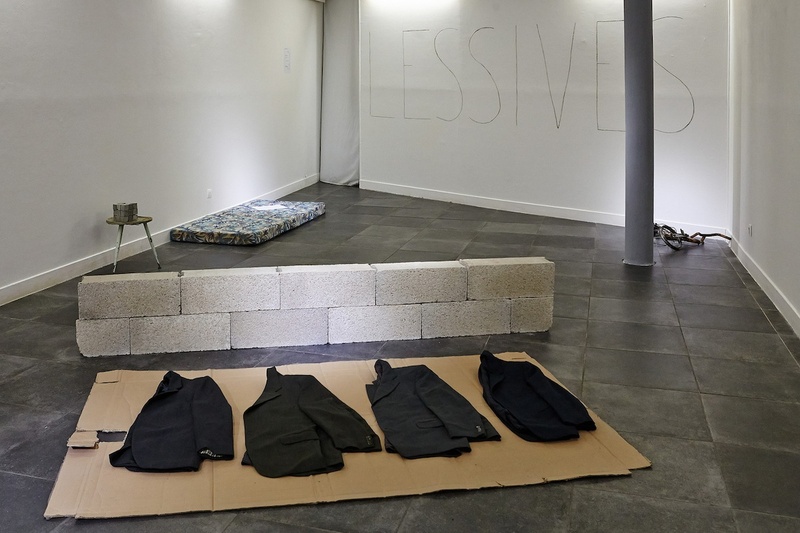 In the shadow of a low line of concrete blocks crossing the space transversally – which could stand for either the current building craze, or a precarious shelter – four second-hand cheap dark suits were carefully laid down on a piece of cardboard, the sort of suits one would readily associate with those worn by older men from the southern side of the Mediterranean. The effect was strangely poignant, as one couldn’t help thinking that these are the very populations that the Marseille authorities are intent on disposing of in their new vision for the city. Not all that surprisingly, but still unsettling, was how little the cultural diversity of the city was represented amongst the exhibited artists in the galleries of the city centre, a fact compounded rather than compensated for by the Galerie du 5e exhibition ‘Beautiful Africa’. The gallery itself is an interesting place, sited as it is on the 5th floor of the Galeries Lafayette, one of the main department stores of the city; you get to the gallery space after crossing the children’s toys and clothing displays. The space is bright and spacious, but felt thematically and conceptually overcrowded. It proposed nothing less than a stroll, at once leisurely and critique, through the continent of Africa. 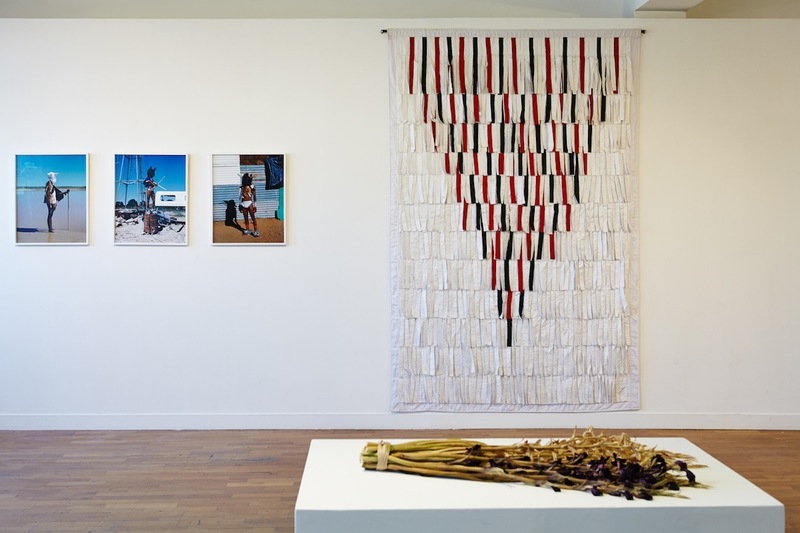 The exhibition brought together nine artists whose work is somehow related to Africa, three of whom would be familiar to Irish visitors of EVA 2016 . Two of Abdoulayé Konaté’s textile compositions, mixing national and religious colour symbolism, were on display as were photographs from the Alterscape series by Otobong Nkanga. There were also floral arrangements from Kapwani Kiwanga’s Flowers for Africa: the arrangements are created afresh by a florist for each exhibition and reproduce bouquets or boutonnières seen on archival documentation of celebratory moments of the independence of African countries. Algeria for instance is a bouquet of red and white gladioli, as per the artist’s instructions, the flowers are to be left to wilt over the duration of the exhibition. 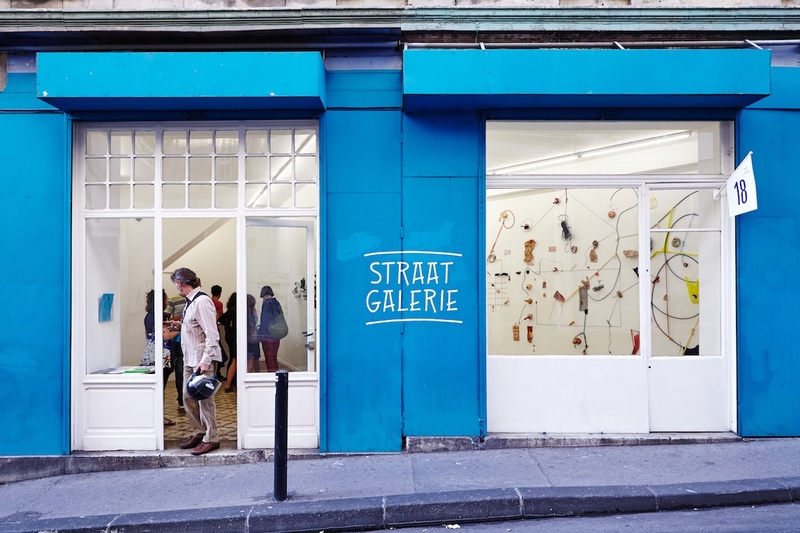 Those few days spent in the Phocaen city were intensely enjoyable and the Printemps de l’Art Contemporain’s organisation offered many opportunities to marvel at what the contemporary art scene had to offer. Marseille’s reputation as a city of the arts seems all set to rise with the recent opening of the Chevalier Roze’s contemporary art hub near the rue de la République and the city getting ready to host Manifesta in 2020. A recent article in Frieze commented: “ A fresh wind is blowing and there are signs that the international art circuit is finally paying attention.”  Aside from the necessary cautionary note that it may all come to nothing given the still tiny art market in the city for instance, one can’t help feeling that if all goes ‘according to plan’, what distinguishes Marseille not being a strong selling point, it will have to look more and more like any other European city. Here, as elsewhere, is conformity the price to pay for economic and cultural success? The ‘Printemps de l’Art Contemporain’ took place in Marseille and its region from 25 Mai to 11 June 2017. The Alteo factory in Gardanne have of an aluminium factory near Marseille whose Red Muds waste have become infamous. From an interview with Thierry Tatoni, Professor of ecology at the university of Aix-Marseille and director of the Mediterranean Institute of Biodiversity and Ecology, in the publication ‘Vies d’ordures, de l’economie des déchets’, Mucem 2017. “MARSEILLE, ville organique qui nourrit mon regard de sa richesse pauvre oú les cheveux, les vêtements, les sacs plastiques sont bougés par le vent”. EVA 2016, ‘Still (The) Barbarians’ was curated by Koyo Kouoh.